A Detoxifying, Relaxing Ionic Foot Bath to Super-Charge your Health! AMD IonCleanse® (Ionic Foot Baths) are the #1 industry leader in helping to detoxify your complete body. Cheryl & I have known the Moroney family (Bob, Barbara and Neill personally) for over a decade. A Major Difference, Inc. is the manufacturer and worldwide distributor of the IonCleanse® Premier® ionic foot bath and the IonCleanse® Solo® detox foot spa. Since its introduction in April of 2002, AMD has sold over 10,000 detox foot bath machines and continues to be the industry leader for technology, education, and research regarding ionic foot detoxification. There is an increasing awareness of the major pillars of health and wellness: detoxification, diet & exercise, health & nutrition, and spiritual awareness. AMD offers you the most comprehensive ionic foot bath detox program available. We also offer the most comprehensive doctor support and customer service available. From overnight warranty repair services to clinical phone consultations with naturopathic doctors, we have your practice or your family covered. Cheryl, our children & grandchildren, and I have all used and still use the AMD IonCleanse® (Ionic Foot Bath) today! AMD IonCleanse® Ionic Foot Baths - How Does it Work? The array goes into the water with the hands, feet, or other body parts, and the control unit delivers a small direct current into the array, which causes the metals within the array, in combination with the water and salt, to generate positively and negatively charged ions. These ions neutralize charged particles in the body. The neutralized particles are pulled out of the body through the skin via osmosis and diffusion. Osmosis and diffusion involve the movement of particles through a membrane, from a lower concentration to a higher concentration. In this case, the higher concentration is the ion field set up by the array in the water. NOTE: A bottle of Ultra-Safe Plus+ is still sent with every new order purchased to help clean the array. For the purpose of IonCleanse® discussions, positive and negative relate to electrical, rather than chemical phenomena. When the IonCleanse® is set on positive, the current flows to the positive pole in the array, which results in more negative ions being produced in the water, 4H2O + 4e- ---> 2H2 + 4OH-. In this polarity we have hydrogen gas coming from the array, and we are left with an abundance of negatively charged ions in the water. Therefore, positive polarity generates a negative ion flow. When the IonCleanse® is set on negative, the current flows to the negative pole in the array, which results in more positive ions being produced in the water, 2H2O --- O2 + 4H+ + 4e-. In this polarity we have oxygen gas coming from the water, and we are left with an abundance of positively charged ions in the water. Therefore, negative polarity generates a positive ion flow. This process is known as the electrolysis of water. Ionization has been used for many decades. However, the concept of using ionization in a foot bath, such as the IonCleanse®, is a relatively new idea. Similar phenomena occur while walking along a beach or near a waterfall. Ions are generated by the movement of the water molecules. We are creating the same reactions with the Ion Cleanse®, only magnified many times over. Disclaimer: The IonCleanse® Premier® & Solo® is part of a comprehensive health and wellness system and the information provided by A Major Difference is solely for use as part of a self-improvement program. None of the information provided on this website is intended to act as a substitute for medical counseling. 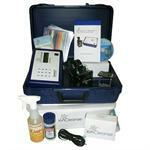 The IonCleanse® Premier® is not intended to treat, prevent, cure, or diagnose any disease or ailment. When you purchase either the Premier or Solo Ionic Foot Bath, we will include the domestic HIS** (handling, insurance & shipping**) for FREE.